Working in a team with students! 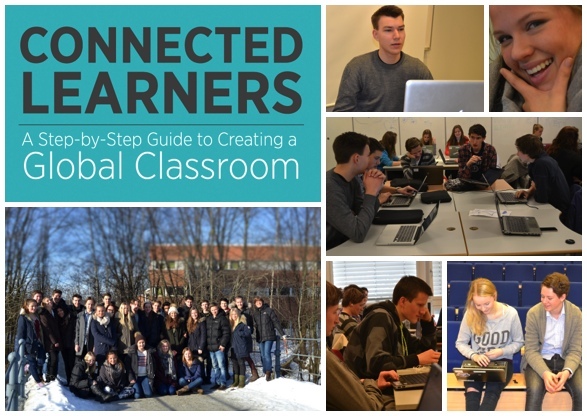 Connected Learners: A Step-by-Step Guide to Creating a Global Classroom. One of the most important parts of writing a book with my students, for me, has been the way it has brought the class together, and how well I know my students this year. When you write on a project like this you suddenly find yourself in a different position. We had project leaders and we had chapter editors, We had writers and we had students eager to contact the press. Everyone was pulling the project in different directions! Since we clearly had a common goal, this has worked out really well. When introducing the book now that it is published it is easy to focus on the fact that it is written by 27 students together with their teacher. One of my main concerns about changing the classrooms has been that few teachers read much about this topic, and hardly any students do. That is why I wanted to share what I have been reading, and topics I have heard about at conferences and seminars, with first my students, and then other teachers! My reading list is vast and diverse and just to give you an idea I have included my bibliography here. Every topic I think is interesting and important in teaching and learning in schools today has been presented in our book. And every topic has been commented on by the students. That is the way this project has been. And this is the idea behind the book. I certainly hope more teachers and students at teacher colleges will read this and take part of the ongoing discussions online! Bellanca, J. 21st century skills. Boss, S. Bringing Innovation to School. Brown, J. S. A new culture of learning. Carr, N. The Shallows, How the internet is changing the way we think, read and remember. DeLorenzo, R. A. Delivering on the promise. Ferriter, W. Communicating and connecting with social media. McLeod, S. What school leaders need to know about digital technologies and social media. November, A. Who owns the learning, preparing students for success in the digital age. Nussbaum-Beach, S. The connected educator, learning and leading in a digital age. Pariser, E. The Filter Bubble, What the internet is hiding from you. Pink, D. H. Drive, the surprising truth about what motivates us. Stoll, C. Reawakening the learner, creating learner-centric, standards-driven schools. Turkle, S. Alone together, why we expect more from technology and less from each other. Wagner, T. Creating innovators, the making of young people who will change the world. Weinberger, D Too big to know, rethinking knowledge now that the facts aren’t the facts. Zhao, Y. Catching up or leading the way, American education in the age of globalization. Ann – Thank you for being the true teacher you are and sharing your enthusiasm and vast knowledge with others.